Having a sewing machine at home can be very useful when you want to make small pouches, accessories, and of course clothes if you know how to. Sewing machines nowadays are already computerized making it easy even for beginners to sew. For those who want to sew thick materials such as leather and denim, or quilting, it will be harder to find the perfect sewing machine. 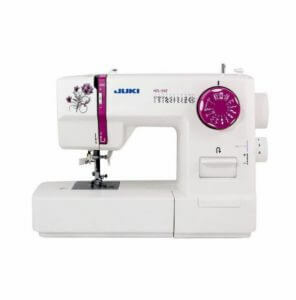 There are a lot of popular brands available from Juki, Singer, Janome, Jaguar, and Brother, all with the great reputation, making it harder to choose. We will be discussing the pointers in choosing the best sewing machine for your home, and show you the top 10 best sewing machines in rank order. Buying a good sewing machine will cost you some money. Be sure to check and compare each product to avoid any future regrets. What are the pointers to keep in mind when purchasing a sewing machine for your home? You need to find something that you can maximize all the features. Let us first look into the pointers as below. The sewing machines being sold are widely divided into 3: “Computer”, “Mechanical” and “Electronic”. The most common type is the computerized type, but it will still be better if you know the difference of the 3 types. Computerized sewing machines contain microcomputer that can control the needle movement, the stitch length, and design. The sewing machine will do all the work, even beginners can “sew” with ease. We highly recommend the computerized sewing machines, although they are very expensive compared to the other types. Though when you check websites like Amazon, the computerized sewing machines still come on top of the list. Many people might think they are hard to use, but don’t worry, they are very user-friendly. For example, most computerized sewing machines have the automatic thread tension function, eliminating the time you need to spend on adjusting the thread at the beginning. Some also have a threading function, or the error notification function, which can be very helpful for beginners. Although, as mentioned earlier, each additional function will make the price higher. It will be better to choose the functions that you really need, than choose the product will all the functions available. The electronic sewing machine is the hybrid of mechanical and computerized sewing machines. You can start and stop it with just one push, and you can also control the sewing speed. This type is the most common household sewing machines, right before the computerized sewing machines took over. Unlike the computerized sewing machine, you need to do the thread adjustments manually, and there are fewer patterns available with this type. Though it still has enough power to sew thick materials. The basic use is usually taught in home economics class (depending on the school), so it might not be too difficult for everyone. Though we cannot recommend this type to total beginners. Mechanical sewing machine is the most old school. The internal motor will power the needle movement. 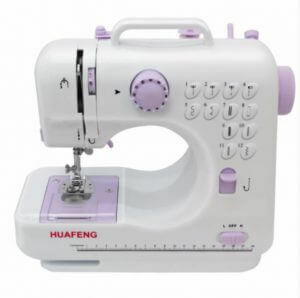 This type of sewing machine does not have the useful functions like the threading function, or the automatic thread tension function. You need to do all of them manually. Also, the sewing power depends on your sewing speed, so if you want to sew thick materials, you would need the ability to sew really fast. One merit is its price. They are very cheap, you can purchase one with less than ₱3,000. Although we can only recommend it to experts in using sewing machines. 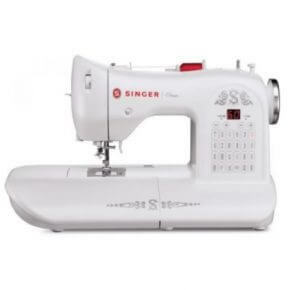 For those who are scared to sew quickly, we recommend mechanical or computerized sewing machines. 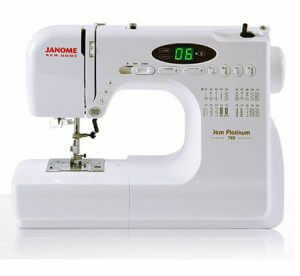 The basic sizes for household sewing machines are “Full size” and “Compact size”. Depending on the brand, there can be products in the middle of full size and compact size, but the usage is mostly the same as the compact size, we can categorize them as just one. A regular sized sewing machine that weighs around 7 kg to 10 kg. Beginners might think “too heavy” or “too big” but full-size sewing machines are equipped with complete sewing machine functions, making it the best option for beginners. The best part is it has the power to sew thick layered materials. Its internal parts are all metal and very durable, some even come with a long-term warranty. The disadvantage is its weight, size, and price. A full-size computerized sewing machine will surely be expensive. It might not be ideal for those who are planning to only bring them out when you need to use it, as it can be very heavy to store or bring out frequently. The compact size is very popular among beginners. It is very lightweight compared to full size, mostly around 5 kg. They are more affordable too. Although they are compact, the functions are almost the same as the full size. The difference, however, is their power. 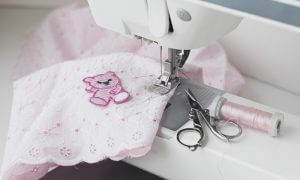 Most products claim that it “can sew thick materials”, but it is not that easy with compact size sewing machines, and can skip a stitch or the needle might not go through if you’re not yet used to them. The materials used for internal parts may become plastic for compact size sewing machines, so their durability is lower. The warranty is shorter as well, compared to full-size sewing machines. Those that can only do a straight stitch, those with a lot of stitch choices, those that can quilt… There are a lot of functions to choose from. Depending on the product, some functions are only available if you purchase an accessory. Be careful of this too, as you might mistakenly think the product already has the function. Some have the computer guidance function for those who have no idea on how to use sewing machines. Some have the error display function. 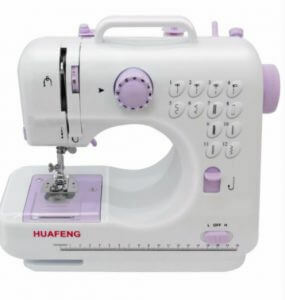 All these functions make it easier for beginners to use sewing machines. We highly recommend beginners to rely on these functions for smooth usage of your sewing machine. Some people may be thinking “all computerized sewing machines can embroider or quilt”, but the most common computerized sewing machines don’t. If embroidery or quilting is your priority, you might need to purchase a different machine just for embroidery or quilting, or double check if the embroidery function is indicated before you purchase a sewing machine. There are also very few embroidery machines/accessories available, so it is more advisable to look for a sewing machine with embroidery function. If you have a table for your sewing machine, then we highly recommend using a foot controller. It can be a lot easier for beginners, than using your hands to push the start button. You can use both your hands to keep your stitches straight. Some products come with a foot controller, but there are also products where you need to buy the foot controller separately. Be sure to check them out before purchase. Finally, we will show you the top 10 sewing machines in our list. 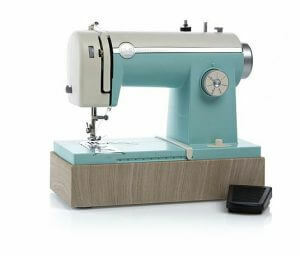 We will include both full size and compact size sewing machines, and compare their reviews here too. Hope you can find the perfect product for you. This compact sewing machine has 12 stitches that you can choose just by pressing the button of your choice. Only weighs 3 kg, highly recommended for those who want to bring this to your travel destination for sudden fashion malfunction or emergencies. A bad thing about this product is it might take a while before you get used to it. You need to manually set up the needle and thread before you can start sewing, and if not set properly, the machine suddenly stops. This sewing machine is perfect for beginners, who want to learn all the basics about sewing without spending so much. It has all the basic functions of a sewing machine – automatic buttonhole, decorative and quilting stitches, twin needle to name a few. Very user-friendly, even to those who just started using sewing machines. It even comes with a 1 year warranty, a bit long for a compact size sewing machine. 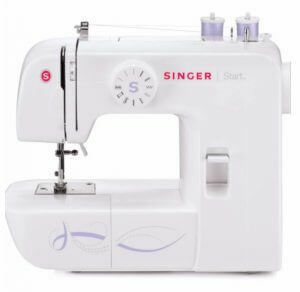 This sewing machine is perfect for those who want to learn and have long-term goals on sewing. It has all the basic stitches, even an automatic four-step buttonhole. The stitch styles available are minimal, but it has the power to sew thick materials, giving you a wider range of items you can create, even with limited stitch styles. 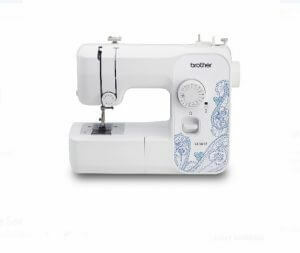 This sewing machine will let you use both your hands to support your material while you sew, as it comes with a foot controller. It also comes with an automatic needle threader, if you’re one of those who hates the threading process, this is perfect for you. You can sew smoothly onto almost any cloth material. There is also a video instruction manual for beginners! Such a big help, right? 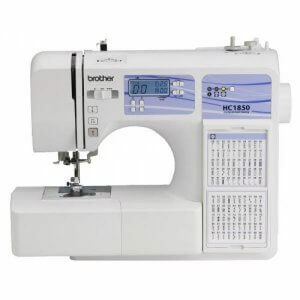 Brother is known to be quieter than the other brands when it comes to sewing machines. 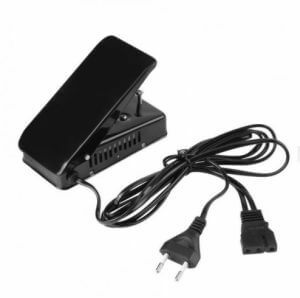 This product also has that characteristic, and users were amazed by how quiet it is for a sewing machine. Sew your clothes without waking the kids at night! You can sew on leather and denim with this, but it might be better to start off with the thinner ones first so you know how the machine would work on them. 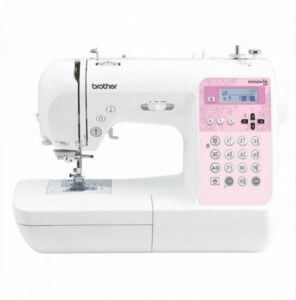 This sewing machine is perfect for beginners who already possess some artistic skill. This comes with 303 built-in stitches, with 10 one-step buttonholes and 165 alphanumeric characters. Very user-friendly, and has a variety of stitches. If you love sewing designs onto your creations, then this is what you’ve been looking for. If you only need simple stitches, then this sewing machine may be too much for you. 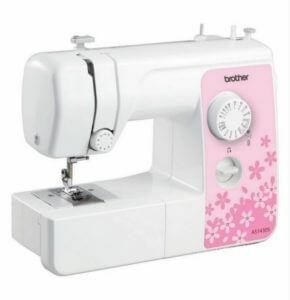 This sewing machine is very durable and very easy to use, perfect for beginners with zero experience. It has an automatic needle threader and drop-in bobbin with a clear cover plate, for easier and faster set up time. It has a “feed dog drop” – it can be transformed into a quilting or embroidery machine. With this feature, it will be easier for you to customize your creation with embroidery or with beautiful quilts. 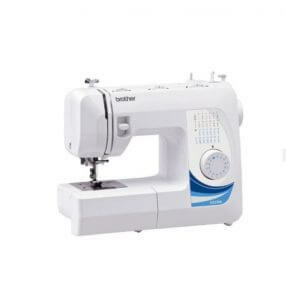 This sewing machine is best for beginners as it has the SwiftSmart Threading System with a one-touch automatic needle threader. It will help you begin sewing without all the hassle of setting up the machine. The OneTouch stitch selection is automatically set at the optimal length and width, but sewing experts can adjust it to their setting manually too. The foot controller also has a sensor that will ensure your foot is in the correct position. A very helpful function for beginners. It also has an extra large sewing space, to sew those hard to reach areas with ease. Sometimes, one of the reasons we sew is to save money. You can save a lot if you can sew your own bed sheets, curtains, cushion or pillowcases, etc. Though if your sewing machine consumes too much energy, then all the money you saved will just go to your electricity bill. This computerized sewing machine will not only give you 135 built-in stitches (including alphabets), 10 buttonhole styles, it can also stitch 850 stitches per minute while consuming lesser electricity compared to other products. Beneficial to you, your wallet, your family, and the environment! We’ve finished showing you the top 10 sewing machines, how was it? There were a lot of products from different brands, some may look similar but have different functions. 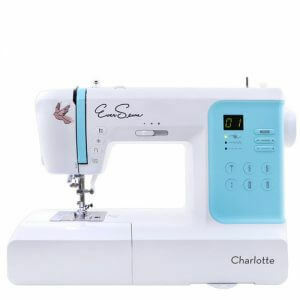 To find the best sewing machine that you’ll use for a long time, you need to think about how you’re going to use it, and what functions you are going to use. Hope this article helps you in finding the perfect one for you!